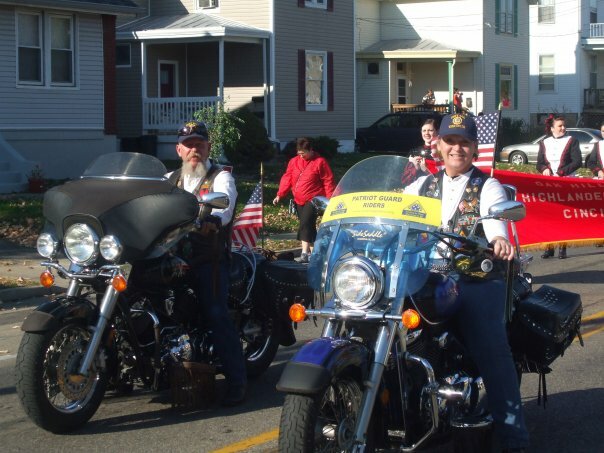 Post 644 participating/fundraising at the 2015 Car Show on Labor Day in North College Hill. 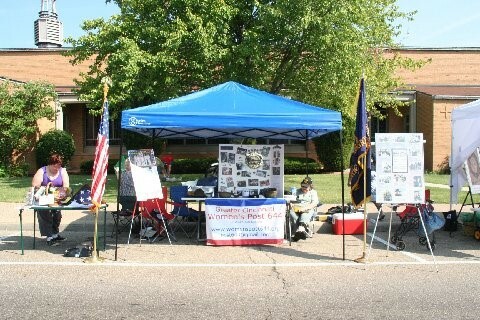 Attending were Joyce, Josh & Rhiannon Leneave, Nelda Chandler, June Whitney, Deborah Sapp, Past Cmdr. 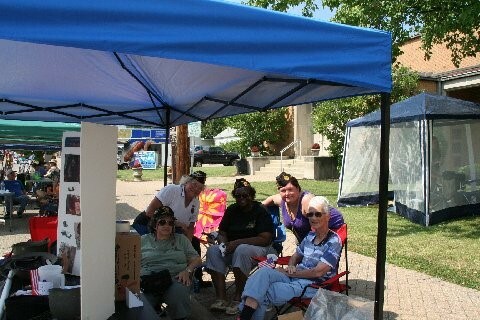 Darleen Adkins, Sandy, Cmdr Blue of the DAV and the Vixens for Veterns. 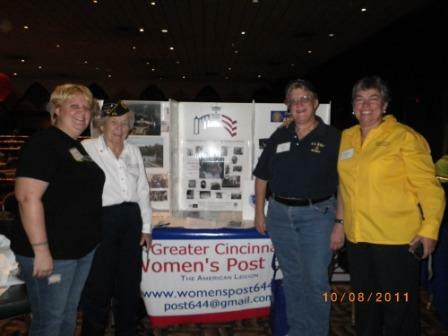 Post 644 hosts our Women Veterans History Exhibit at the University of Cincinnati Women's Soccer game on 9/11/10. 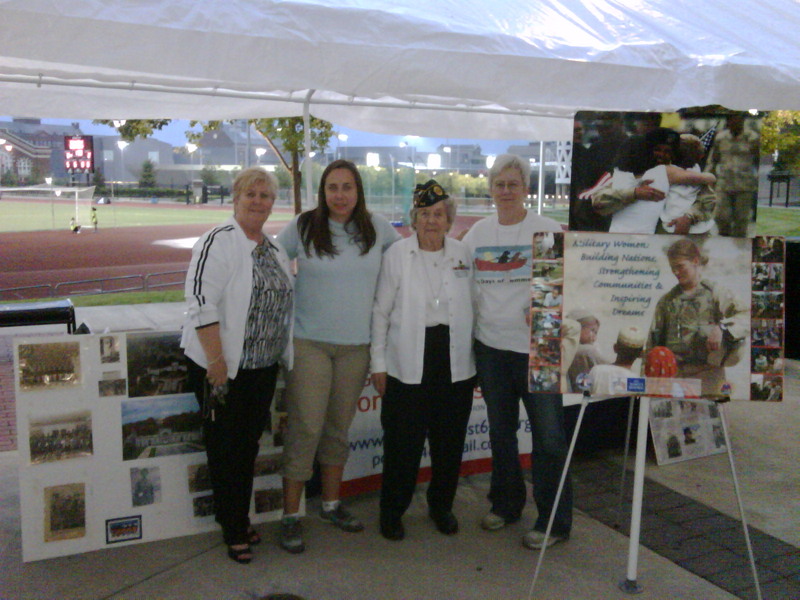 The soccer team dedicated the game to veterans and to all who were lost during the 9/11 terrorist attacks. 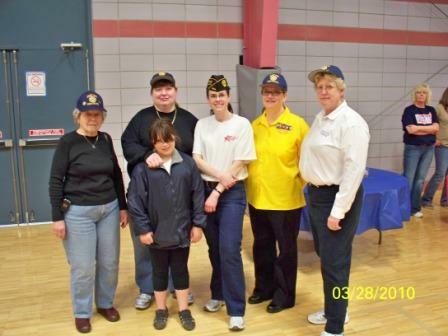 Members of Post 644 and family members helped The Thank You Foundation with the USMC Welcome Home Party on Sunday 28th March 2010. 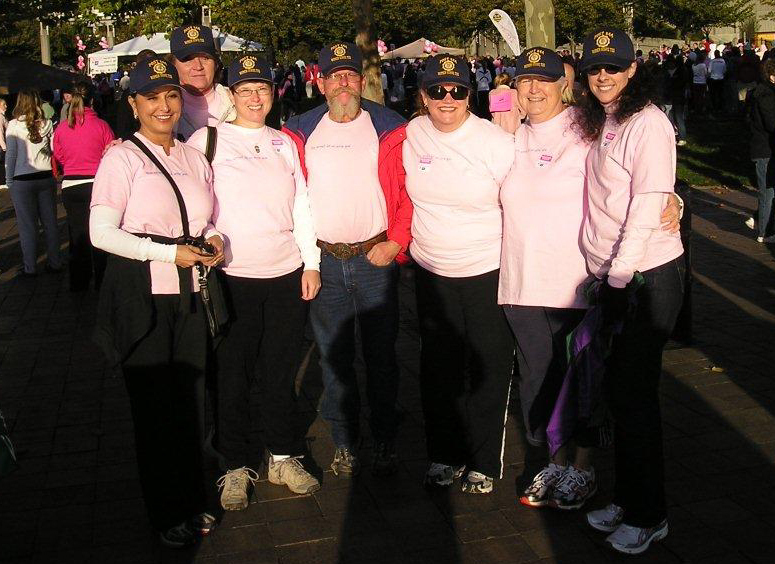 From left to right: Lynn Ashley, Linda Clifton and Daughter, Amy Carter, Jane Root and Kym Mader. 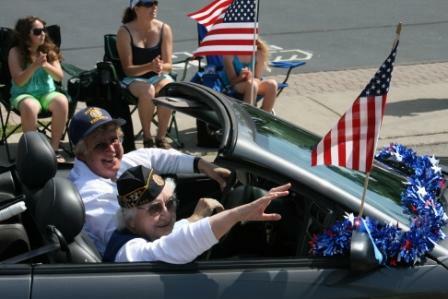 Not pictured are Patricia Johnson and Bela Mader. 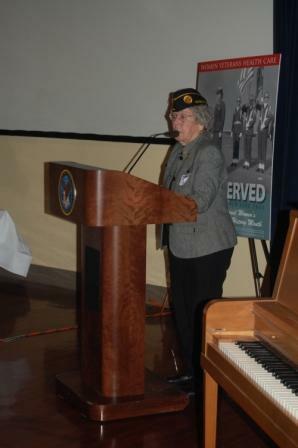 Post 644 member Lynn Ashley delivers the keynote address at the 9th Hall of Heroes Open House for the Winton Woods School District in Cincinnati, an annual event to honor men and women who have served in our nation’s military. 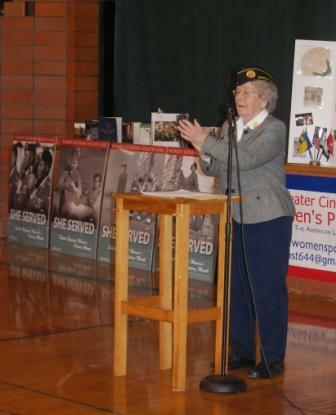 The title of this year’s open house was “Honoring Women in the Military,” and Dr. Ashley spoke about her experiences in the Women’s Army Corps (WAC) in WWII, as well as Post 644’s ongoing efforts to advocate for women veterans of yesterday and today. 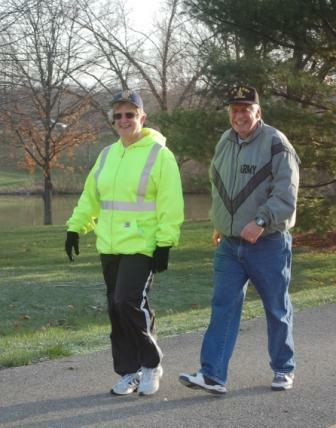 Post 644 member Kym Mader and her husband Bela participate in Post 644’s first annual Women Veteran’s 5K run/walk on March 27, 2010. 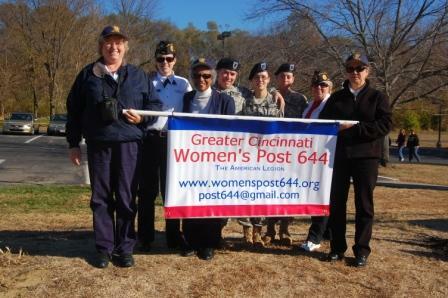 The run/walk was part of the Post’s celebration of Women’s History Month and helped raise awareness about the contributions and health issues of women veterans. 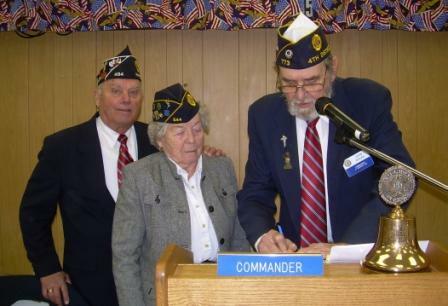 John Rolke, 4th District Commander, signs a Post 644 Resolution that was adopted by the 2010 4th District Spring Conference. 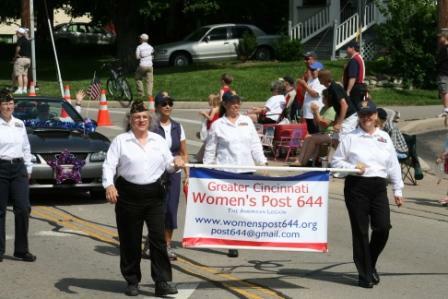 The Resolution, which originated from the Greater Cincinnati Women’s Post 644, calls for the repeal of the antiquated combat exclusion policy for female military members. 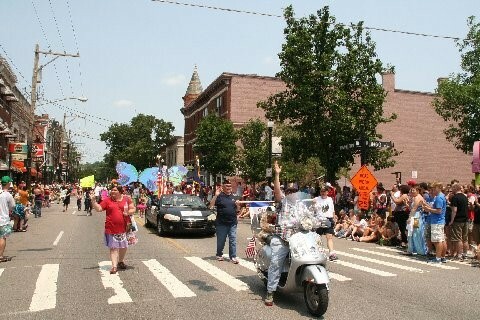 Looking on are Resolution author Lynn Ashley and Hamilton County Commander Charlie Sollberger. 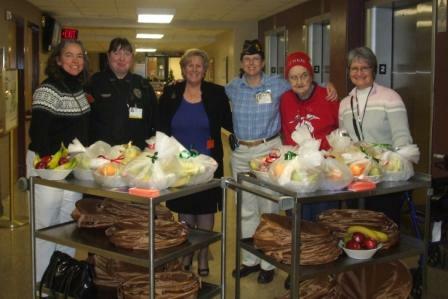 Members of Post 644 helped prepare and distribute 92 fruit baskets and gifts to veterans who were hospitalized at the Cincinnati VA over the holidays. 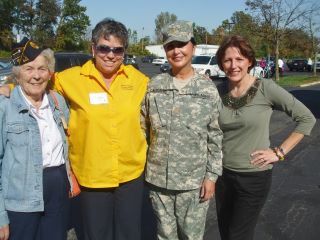 From left to right: Darleen Adkins, Linda Clifton, Patricia Johnson, Commander Kelly Knox, Past Commander Sr. Marguerite McHugh, and supporter Sandy Allen. 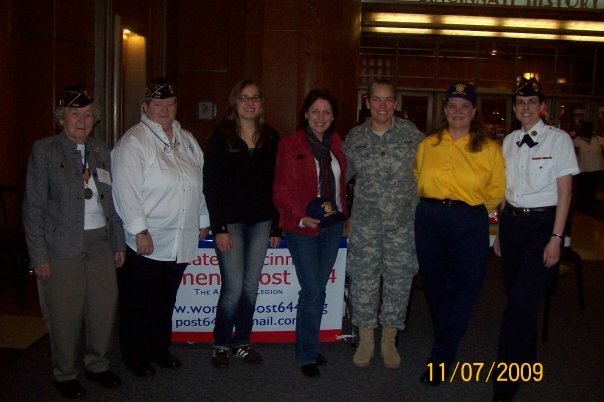 13 Nov 2009 - Women Veterans Appreciation Luncheon and Health Fair. 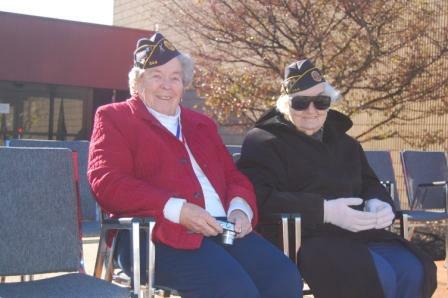 The theme was “Women Veterans – Then & Now.” Lynn Ashley (left) represented “then” by speaking about her experiences in WWII, and Iva Griggs (right) talked about “now” with her slideshow about Iraq. 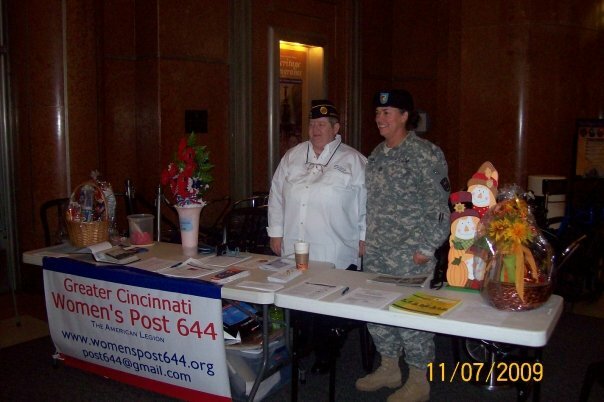 Members of the Greater Cincinnati Women's Post 644 of the American Legion gathered as part of a special event to honor women veterans. 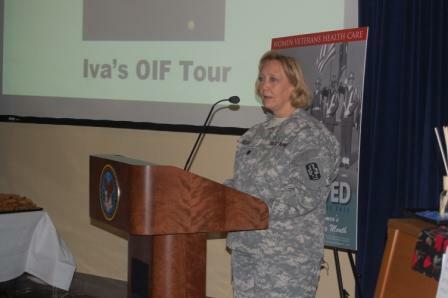 The event featured free screenings of the film "Lioness," which follows five women who were sent overseas as mechanics, clerks and engineers, and ended up in some of the bloodiest battles of the Iraq War with little or no combat training. 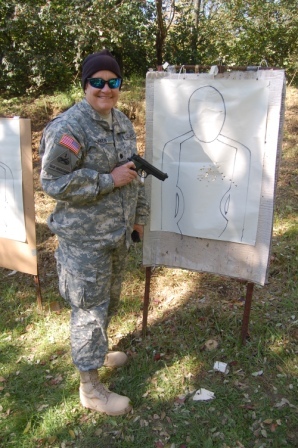 17/18 Oct 2009 - Members of Post 644 hosted a Concealed Carry class and day on the range in October. 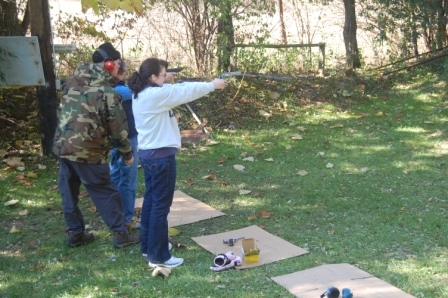 Now the members are interested in starting a shooting club – stay tuned! 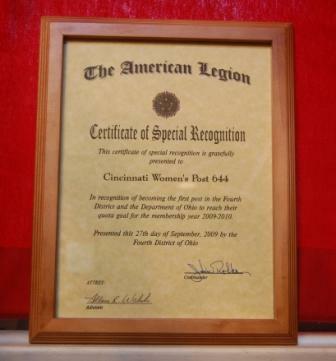 Post 644 was recognized at the Fall convention, the District presented the post with a Certificate of Recognition for being the first post in the District and in the Department of Ohio to reach its membership quota. 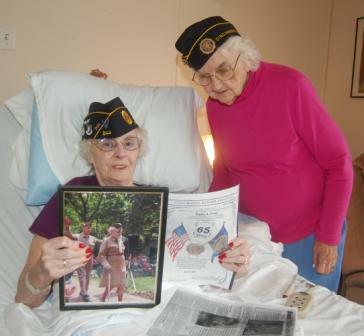 Emily A. Clark, who served as Commander of the Greater Cincinnati Women's Post 644 for many years, receives a certificate for 65 years of continuous membership in The American Legion from outgoing Post 644 Commander Sr. Marguerite McHugh, SND. 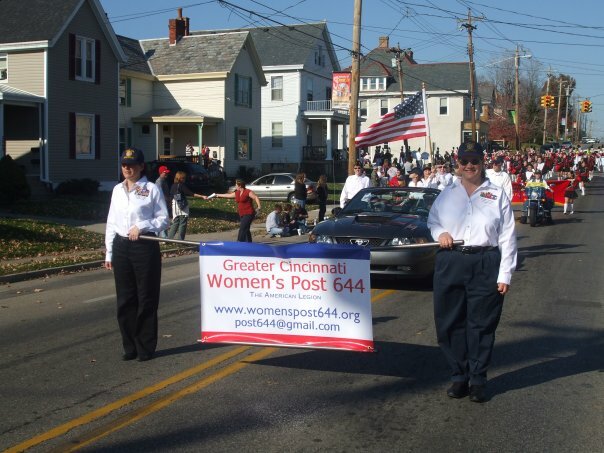 Mrs. Clark said she is thrilled to see a younger generation of women veterans taking leadership of Post 644, which is the only remaining women's post in Ohio and one of only six in the country. 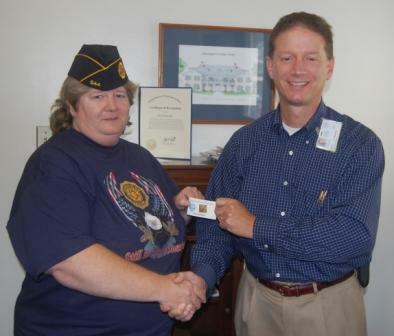 Post 644 member Kim Gwinner receives an award for 2,500 hours of voluntary service to the Cincinnati VA Medical Center from the hospital's Associate Director David Ninneman. 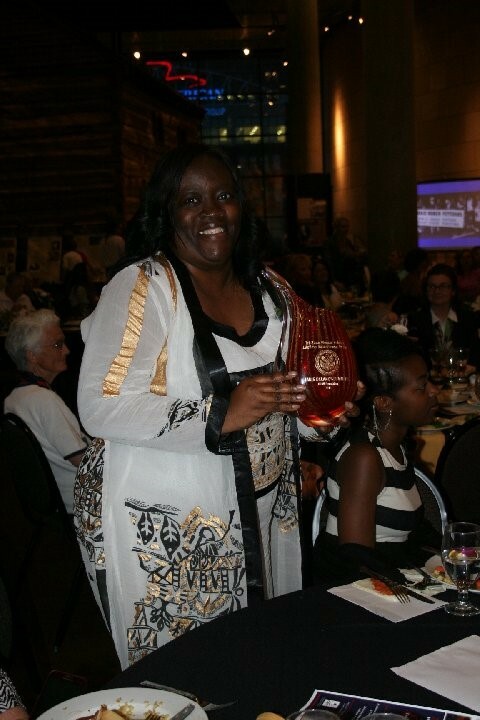 Gwinner has volunteered with the Cincinnati VA's PTSD treatment division for over three years and has recently been promoted to the role of peer support specialist for her dedication and service to veterans who are recovering from Post-Traumatic Stress Disorder. 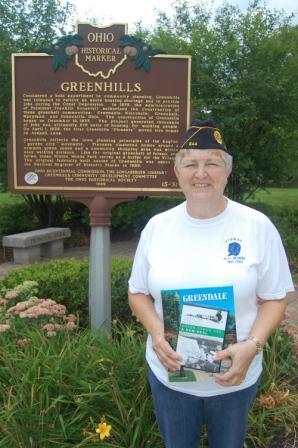 Post 644 member Betty Downs of Greenhills traveled to Wisconsin and Maryland this year to research the revitalization of other New Deal communities like hers and advocated for the historic preservation of her community. 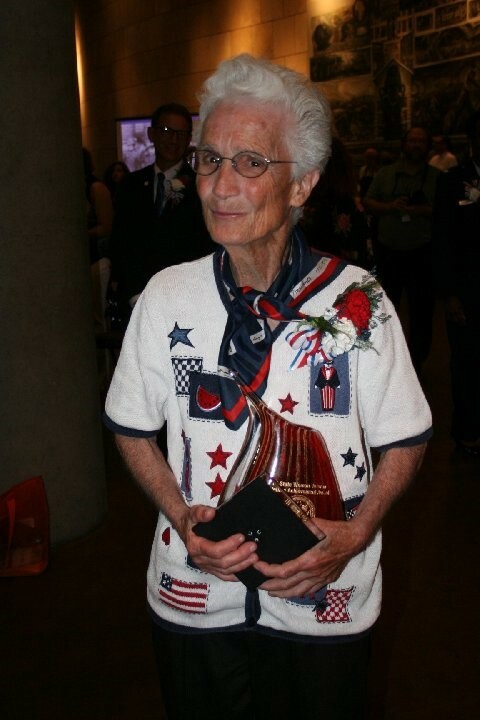 She also donated a book about the history of the community to her local library. 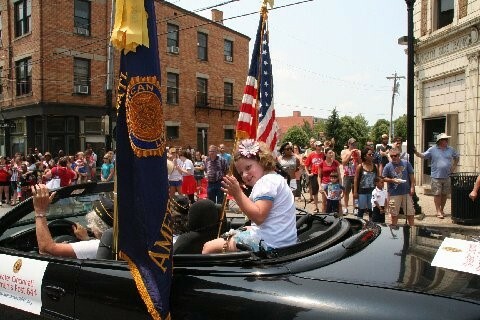 Post 644 enjoyed the hospitality of the Hyde Park - Mt. 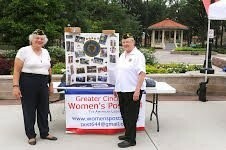 Lookout Post 744 at the County Council Picnic. 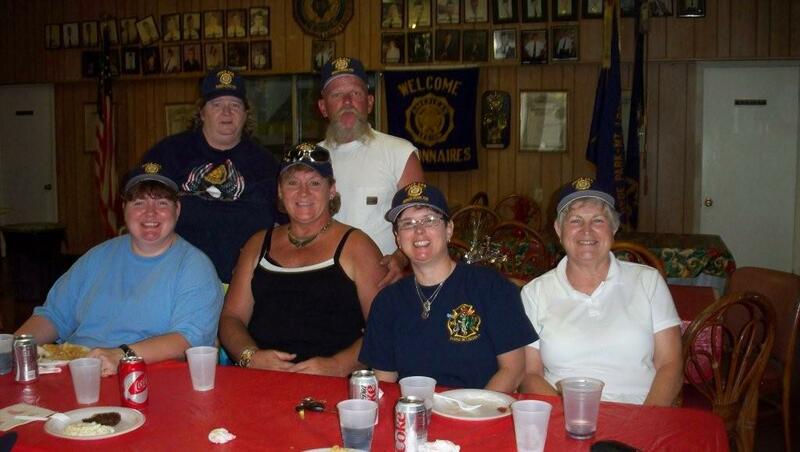 Pictured from left to right are Linda Clifton, Kim Gwinner, Tammy Berry, Lee Berry, Kelly Knox, and Betty Downs.